Gravity or Police, these guys don't believe in any law. 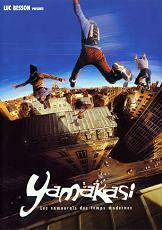 Idolized by the youth of Paris as much as they're hated by the police, they are the Yamakasis, modern samurais. With acrobatic skillfulness and adrenaline pumping belief in their own immortality, they throw themselves out from incredible heights, and jump from roof to roof. Locked doors and "No Trespassing" signs become irresistible challenges. But one day, while mimicking one of the Yamakasi's more dangerous stunts, a young fan gets injured. Only one operation can save the boy, an operation that his family can't afford. (In French language).